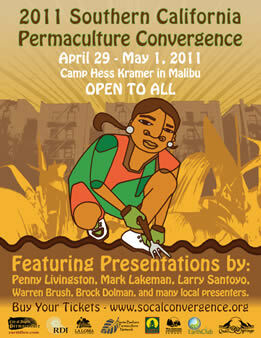 The 2nd annual Southern California Permaculture Convergence is happening only one month away on April 29-May 1 in Malibu. Dozens of permaculture speakers: Penny Livingston-Stark, Mark Lakeman, Larry Santoyo, Brock Doleman, Warren Brush, James Stark, Benjamin Fahrer, Darren Butler, Joan Stevens and so many more! I have had the honor and privilege of studying under with Penny, Larry, Brock and of course James and this is a stellar line up of the most cutting edge permaculture teachers – what an exciting event! There will be presentations on Mushroom Cultivation, Transition Towns, Time Banking, Raising goats, Intro to Permaculture and so much more. A Kids corner going on all day Saturday with some amazing activities happening there. Mini Cob House construction, seed balls and rocket stoves, nature games and more. The kids will have a blast!! Music from amazing local musicians, free giveaways, organic meals. There is so much going on and yet ticket prices are just $125 for camping or $150 for bunkhouse (ask for special kids discount codes).